of Highway 831. The statue was constructed in 1998 by the Victoria Home Guard Society to honour the original 20 members of the Northwest Mounted Police who traveled to Fort Edmonton on Victoria Trail in 1874. 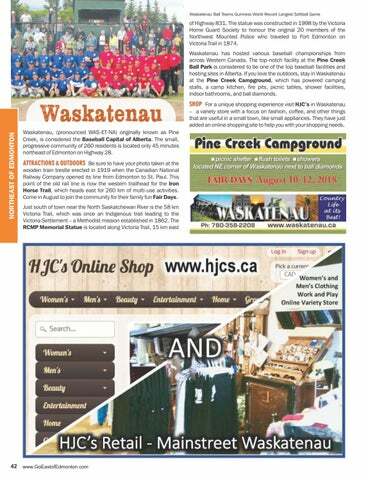 Waskatenau has hosted various baseball championships from across Western Canada. The top-notch facility at the Pine Creek Ball Park is considered to be one of the top baseball facilities and hosting sites in Alberta. If you love the outdoors, stay in Waskatenau at the Pine Creek Campground, which has powered camping stalls, a camp kitchen, fire pits, picnic tables, shower facilities, indoor bathrooms, and ball diamonds. Waskatenau Waskatenau, (pronounced WAS-ET-NA) originally known as Pine Creek, is considered the Baseball Capital of Alberta. 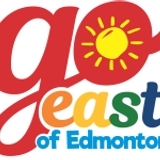 The small, progressive community of 260 residents is located only 45 minutes northeast of Edmonton on Highway 28. SHOP For a unique shopping experience visit HJC’s in Waskatenau – a variety store with a focus on fashion, coffee, and other things that are useful in a small town, like small appliances. They have just added an online shopping site to help you with your shopping needs.